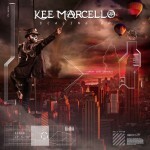 Share the post "Album review: KEE MARCELLO – Scaling Up"
Guitarist with Europe in their commercial heyday first time round, Kee Marcello’s solo career to date has been an unspectacular one, and even his otherwise enjoyable live shows made me inclined to check out his own material more thoroughly. However this latest effort is a revelation, and I would not mind betting his brief from his new record label, Frontiers, was to rediscover some of the spirit of Europe albums from his time such as ‘Prisoners in Paradise’, not least since present-day Europe have left that sound behind. Indeed some songs appear almost to be a redux of that album, with opener ‘Black Hole Star’ very similar to ‘Seventh Sign’, and the blissfully melodic ‘I Don’t Miss You Much’ cut from the same cloth as ‘I’ll Cry for You’. The sassy grooves of ‘Wild Child’ take things a stage further as it was a Europe song that never made an album (though I do remember hearing it as Milton Keynes Bowl in 1989) and indeed there is another Joey Tempest co-write in ‘Don’t Know How to Love No More’. While there has never been any doubt as to his guitar prowess, his vocals are also much improved, other than the odd cringeworthy moment where he slips back into a throat-clearing guttural growl. The sound is satisfyingly full, underpinned by the rhythm section of Ken Sandin and Darby Todd while keyboards add splashes of colour to the likes of ‘Fix You’. Most impressive is the diversity of the songs: ‘Radio’ is an upbeat song of with a Van Halen-esque sense of fun, albeit the lyrical nostalgia is rather close to Bon Jovi’s ‘Blood on Blood’, but in contrast ‘Finger on the Trigger’ has a slow and brooding feel. While the emphasis is on the songs, ‘Soldier Down’ has the classic sound of Deep Purple or Rainbow (or indeed Europe’s first two albums for that matter) with Kee given full reign to show off his guitar style with a flurry of notes, and the title track and ‘Good Men Go Bad’, where he goes off on one mid-song to the backdrop of a seventies sounding riff, are in a similar vein. ‘Scandinavia’ has what appear to be autobiographical lyrics, but the best is saved to last with ‘Blow by Blow’ which combines a sleazy riff that I found lodged in my brain for days, then when the song appears to be fading out he reminds us of his guitar hero prowess by soloing away for a good two and a half minutes. This entry was posted in ALBUM REVIEWS, ALBUM REVIEWS (Mobile), All Posts and tagged album, Darby Todd, Europe, hard rock, Kee Marcello, Ken Sandin, melodic rock, review, Scaling Up. Bookmark the permalink.